Gua Sha (pronounced “gwa sha,”) is an East Asian healing technique. Gua means to scrape or rub. Sha is a ‘reddish, elevated, millet-like skin rash’. Sha is the term used to describe Blood stasis in the subcutaneous tissue before and after it is raised as petechiae. 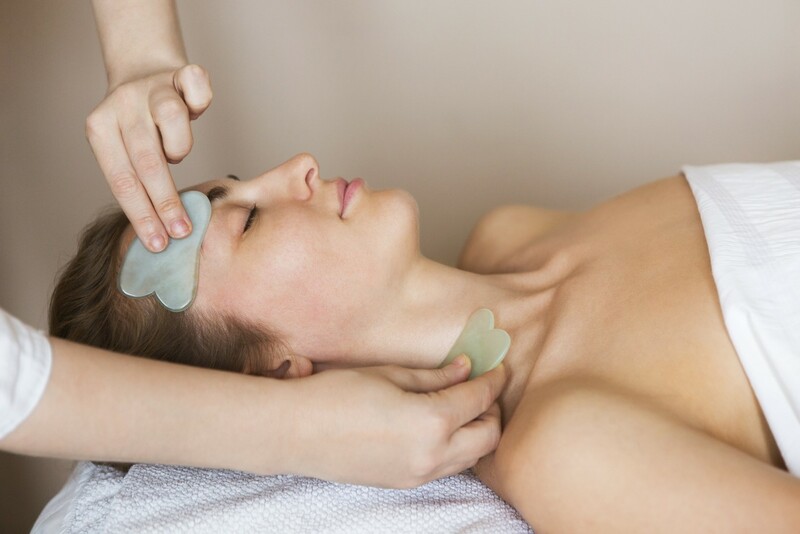 Gua Sha is the technique that intentionally raises Sha rash or petechiae. Reduce fever (the technique was used to treat cholera). Treat fatigue caused by exposure to heat (often used to treat heat-stroke) or cold. Cough and dyspnea: bronchitis, asthma, emphysema. Treat muscle and tendon injuries. Treat sunstrokes / heat syncope and nausea. To assist with reactions to food poisoning. Sha is raised primarily at the Yang surface of the body: the back, face, neck, shoulders, buttocks, and limbs. On occasion, Gua Sha is applied at the chest and abdomen. Skip the areas with moles, cuts or unhealed areas. Hold the Gua Sha tool at a thirty degree angle to the skin allowing the smooth edge will touch the skin. The skin is then rubbed with a round-edged instrument in downward strokes. One area is stroked until the petechiae that surface are completely raised. If there is no Blood stasis the petechiae will not form and the skin will only turn pink. Observe that the sha petechiae should fade in about 2-4 days. If it takes longer to fade, it indicates poor blood circulation and there may be more serious deficiency that will require additional treatments with combination of acupuncture or acupressure in specific areas. Gua Sha treatment can be used up to three times weekly, and is most effective when used as a weekly treatment on chronic conditions. In most cases the patient feels immediate improvement in their condition particularly in their pain or sense of constraint. Gua Sha moves stuck Qi and Blood, releases the exterior mimicking sweating, and moves Fluids. In a modern medical construct these fluids contain metabolic waste that congested the surface tissues and muscles. Gua Sha promotes circulation and normalizes metabolic processes. It is a valuable treatment for both external and internal pain, and facilitates the resolution of both acute and chronic disorders. 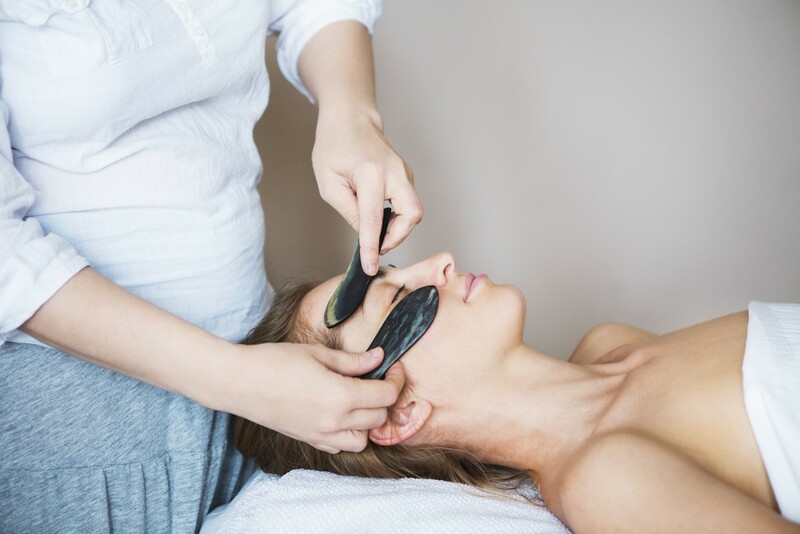 Gua Sha can be applied on face and eye. Gua Sha is used to extract toxic waste, remove blood stagnation, promote normal circulation and metabolic processes of the body. It removes blockage, improves blood circulation and fluid flow. 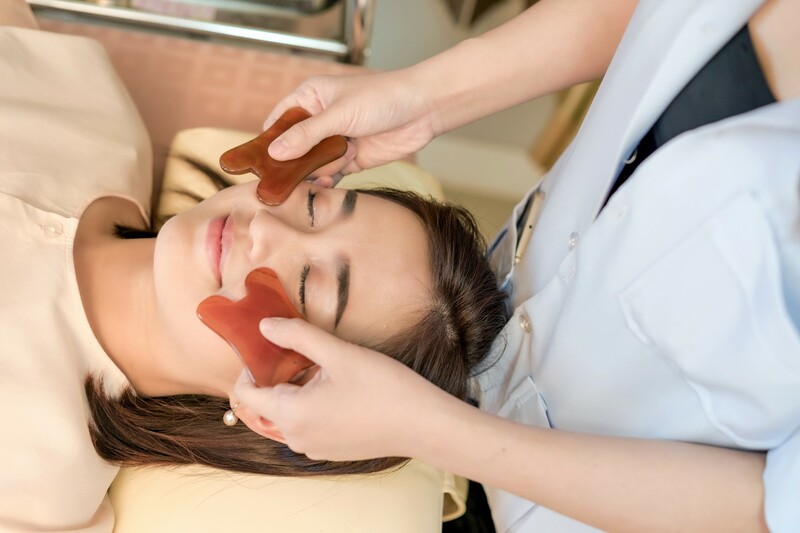 Gua Sha is known to be effective in removing dark eye circle, puffy eye bag, lighten pigmentation and sharpen the face. Gua Sha is a completely safe technique, but it is serious medicine. Knowing when to use it and what to expect from treatment is as important as good technique. People who live in chronic pain often erect emotional defenses to cope with it or can feel completely hopeless. Having that pain ‘touched’ and relieved can be unsettling, even shocking. It is good to be moderate in activity after treatment, even rest. After treatment, stay mellow, no drugs, booze, vigorous activity, exercise, fasting, feasting or hard labor for the rest of the day.